KABUL, Afghanistan — Taliban insurgents carried out a bold assault on a remote base near the border with Pakistan on Sunday, NATO reported, and a senior American military official said nine American soldiers were killed. Taliban insurgents assaulted a base in Kunar Province. The attack, the worst against Americans in Afghanistan in three years, illustrated the growing threat of Taliban militants and their associates, who in recent months have made Afghanistan a far deadlier war zone for American-led forces than Iraq. 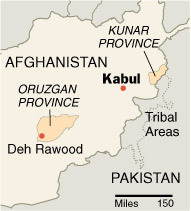 The assault on the American base in Kunar Province was one of the fiercest by insurgents since the American-led invasion of Afghanistan routed the Taliban and Al Qaeda militants in late 2001. The militants have since regained strength in the tribal areas of Pakistan, which they have often used as a base for raids into Afghanistan, an increasingly sore point for the American and Afghan governments. The new American commander of NATO forces in Afghanistan emphasized that issue on Sunday in an interview that took place before details of the Kunar attack were disclosed, asserting that the militants were not only entering Afghan territory but also firing at targets from the Pakistan side. “It all goes back to the problem set that there are sanctuaries in the tribal areas that militant insurgent groups are able to operate from with impunity,” said the commander, Gen. David D. McKiernan, who took over the NATO-led International Security Assistance Force in June. It was the first time a senior commander had stated so clearly that militant groups were not only infiltrating from across the border to attack but were also firing from positions inside Pakistan. NATO officials reported that nine soldiers were killed in the Kunar attack but did not specify the nationalities, in accordance with the policy of letting member countries report them first. A senior military official in Washington said that all nine were American. The Kunar attack also left at least 15 other NATO soldiers — almost certainly Americans — and 4 Afghan soldiers wounded, and it was one of at least three significant attacks on Sunday, including a devastating suicide bombing in a southern city’s bazaar that killed at least 25 people, 20 of them civilians. This year of the Afghanistan war is already proving to be the deadliest since the American-led invasion. Bush administration officials are now considering a redeployment of troops to Afghanistan from Iraq to help deal with the rising threat. Deaths of American troops and their allies for the last two months have been higher than those inflicted in Iraq. In addition, nearly 700 Afghan civilians were killed in the first five months of the year, a marked increase over previous years, United Nations officials have said. General McKiernan, a four-star general who commanded allied land forces during the invasion of Iraq in 2003, said there were three main reasons for the increase in violence: a change in tactics by the insurgents to small attacks on more vulnerable targets, such as the civilian population, district centers and convoys; the increasing progress of Afghan and NATO forces in pushing into regions previously controlled by the Taliban, which has led to more fighting; and the “deteriorating situation with tribal sanctuaries across the border” in Pakistan. General McKiernan’s comments followed a weeklong visit to the region by the chairman of the Joint Chiefs of Staff, Adm. Mike Mullen, who discussed a wide array of security issues with Pakistan’s leaders on Saturday in a surprise visit to Pakistan. Defense Secretary Robert M. Gates, after conferring with President Bush and Stephen J. Hadley, the national security adviser, directed Admiral Mullen to add the stop in Pakistan. Given that this was Admiral Mullen’s fourth trip to Pakistan this year and his second in two months, the admiral’s talks with Pakistani officials underscored the Bush administration’s increasing concern over the rising violence in Afghanistan and its links with the Pakistan tribal areas. “The secretary wanted to take advantage of the fact that Admiral Mullen would be in the region to reinforce our concern with the Pakistanis about the spike in violence in Afghanistan and to keep the pressure on in the tribal areas,” Geoff Morrell, the Pentagon press secretary, said in a telephone interview about Admiral Mullen’s Pakistan stopover. Pakistan, for its part, has complained that American forces have repeatedly hit Pakistani territory, in particular on June 10, when United States air and artillery strikes killed 11 members of the Pakistani paramilitary force, the Frontier Corps, manning a border post. General McKiernan did not comment on the June 10 attack since a three-party investigation into the border clash had not yet been concluded, but he was very clear that militants were using their sanctuary in Pakistan to fire across the border and that the NATO and American forces had the right to fire back. “We have the ability to protect ourselves,” he said. “The point that I am trying to make is that the border security situation is not good, and that border runs for 2,500 kilometers,” or about 1,500 miles, he said. The base that came under attack in Kunar Province on Sunday lies in one of the most inhospitable mountainous regions where American forces have frequently faced fierce battles with insurgents. A NATO news release issued in Kabul said the insurgents attacked the Kunar base with rocket-propelled grenades and mortars, using houses, shops and a mosque in the nearby village of Wanat for cover. Both sides suffered casualties as the insurgents were repulsed, it said. The only bigger single death toll for the Americans in the Afghanistan war came in June 2005 — also near Kunar — when an American Chinook helicopter was shot down by Taliban gunners in heavy combat. All 16 aboard and three others on the ground were killed. The American command also reported a heavy clash on Sunday between Taliban insurgents and Afghan and American forces patrolling in the southern province of Helmand in which it estimated that 40 militants were killed by airstrikes as boats and bridges across the Helmand River were destroyed. A suicide bomber on a motorbike blew himself up in a busy bazaar in the town of Deh Rawood in the southern province of Oruzgan, killing the local police chief and four subordinates. Twenty civilians were also killed and 30 more were wounded, the provincial police chief, Juma Gul Himat, said by telephone. Bodies and wounded people were strewn across the street as the police rushed to help. Taimoor Shah contributed reporting from Kandahar, Afghanistan, Jane Perlez from Islamabad, Pakistan, and Eric Schmitt from Washington.